Engine Cuyahoga Works, Cleveland, OH. Junked by Manistee Lumber Co.
1870 Enrolled Cleveland, OH; owned Northern Transportation Co., Cleveland, OH. 1876, Mar 10 Owned Philo Chamberlain, Cleveland. 1876, Mar 23 Owned Northern Transit Co., Rockport, OH. 1879, Apr 22 Enrolled Ogdensburg, NY. 1880, Apr 21 Enrolled Grand Haven, MI; owned D.H. Day & Co., Glenhaven, MI. 1881, May 14 Enrolled Milwaukee, WI; owned Peter J. Klien, Milwaukee, WI & John Seymor, Manistee, MI. 1887, Apr 28 Burned Lake Michigan; rebuilt Milwaukee Shipyard Co; 165.4' x 28.4' x 12.4'; 715 gross tons; lengthened 30'; 1 deck; 1 mast; renamed CITY OF CHARLEVOIX. 1892, May 9 Owned Northern Michigan Transportation Co., Chicago. 1892, May New fore & aft compound engine by S. F. Hodge, Detroit; reboilered with 2 firebox boilers by John Mohr & Sons, Chicago. 1894 - 95 Rebuilt, lengthened & widened; 185.5' x 33.3' x 12.6'; 835 gross tons. 1899 Installed 2 firebox boilers 8'3" x 14', 125# steam by J. Mohr, Chicago, 1892; owned Northern Transportation Co., Chicago. 1901 Owned Northern Michigan Transportation Co., WI. 1904, Mar 14 Enrolled Duluth, MN; renamed KANSAS. 1912, Jan 18 Enrolled Chicago; owned Chicago, Racine & Milwaukee Line. 1918, Sep 19 Owned Merchants Transit Co., Chicago. 1919, Oct 1 Owned Michigan Transit Co., Chicago. 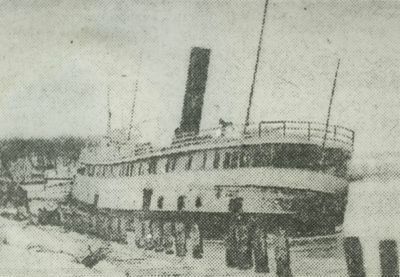 1920, Mar 22 Enrolled Duluth. 1924, Oct 27 Burned at dock, Manistee, MI. 1924, Nov 24 Documents surrendered, Duluth; "fire, total loss". 1925 Junked by Manistee Lumber Co.